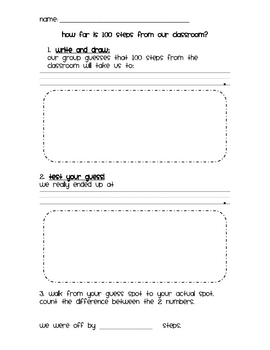 This activity asks students to predict where 100 steps from the classroom will take them. It utilizes measurement, estimation skills as well as subtraction, and is a language arts connection. Students write and draw their predicted location. Upon walking to their guess location, they also have to count the DIFFERENCE in # of steps between guess & actual. They record their actual location and the difference. This was used as a Kindergarten math activity but could easily be used for 1st grade.